~ Please note this database is only available for use in the library. Wondering if that lamp Aunt Meg gave you 50 years ago might be worth something? You can easily find auction records using the P4A ("Prices for Antiques") Antiques Reference.Every record in the database has at least one picture. You can really tell if this is similar to the item you are researching. ~ Requires signon using the barcode on the back of your card if accessed outside of the Library. LearningExpress Library is a comprehensive, interactive online learning platform of practice tests and tutorial course series designed to help patrons—students and adult learners—succeed on the academic or licensing tests they must pass. You’ll get immediate scoring, complete answer explanations, and an individualized analysis of your results. ~ Requires Sign-in if accessed outside of the Library. The TumbleBookLibrary is a collection of TumbleBooks (animated, talking picture books). TumbleBooks are created from existing picture books which are licensed from children’s book publishers and converted to the TumbleBook format. Books, audios, and games to enjoy. ~ Use Public Library Barcode Login if accessed outside of the Library. hoopla is a digital media service that allows you to borrow movies, music, audiobooks, ebooks, comics and TV shows to enjoy on your computer, tablet, or phone – and even your TV! With no waiting, you can stream titles immediately or download to your phones or tablets for offline enjoyment later. You can stream titles instantly through your desktop browser or our mobile app. There are hundreds of thousands of titles to choose from, with more being added daily. hoopla is like having your public library at your fingertips. Anytime. Anywhere. Sign up by clicking Here. At the hoopla site click the “Get Started Today” icon, provide your email address, choose a password and click “Agree”. 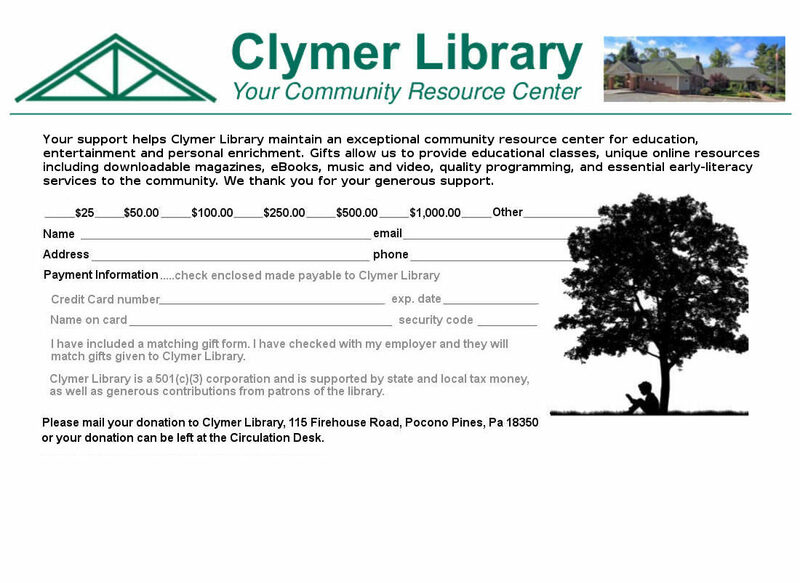 Select Clymer Library and click “Next”. You will be asked to provide your library card number, then click the “Sign Me Up” icon. Project Gutenberg offers over 49,000 free ebooks: choose among free epub books, free kindle books, download them or read them online. They carry high quality ebooks: All ebooks were previously published by bona fide publishers. They are digitized and diligently proofread with the help of thousands of volunteers.